Angler Guy Yocom and his band of anglers have caught a 420+ pound tuna with a rod and reel which is expected to beat the previous record of 405 pounds! 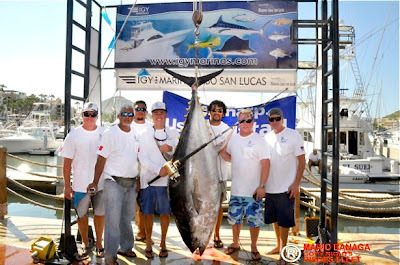 This legendary tuna caught off of the coast of Cabo San Lucas weighed in at 421 lbs and 427.5 lbs respectively on two different scales. This tuna could even be worth one million dollars since Yocom entered a contest that promised to pay that amount to the angler who sets the first International Game Fish Assn. all-tackle world record. Congrats Yocom...your catch can make many a fine tuna melt sandwich for this very proud nation. This tuna now definitely outshines that 21 lb lobster that was caught awhile ago.